Dr. Anupam Khajuria, Researcher of UNCRD participated and delivered a presentation in the 14th International Conference on Waste Management and Technology. This conference was organized by Basel Convention Regional Centre (BCRC) for Asia and the Pacific and UNCRD contributed as a supporting organizer in this conference among others. She delivered a presentation on the topic of 'Outcome of the 9th Regional 3R Forum in Asia and the Pacific'. 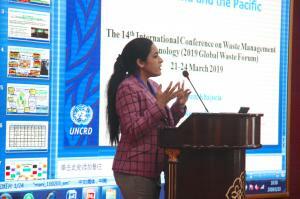 She chaired one session 'Waste Plastic and Marine Litter Control', and participated in the Third Steering Committee Meeting of Basel Convention Regional Centre for Asia and the Pacific and in the Scientific Committee Expert Meeting of ICWMT-14 on behalf of the Director of UNCRD. Her speech focused on the promotion of 3R activities in Asia and the Pacific and showed the significant outcome of Regional 3R Forum in Asia and the Pacific since its inception in 2009. Furthermore, she expressed that recently, UNCRD organized the 9th Regional 3R Forum in Asia and the Pacific (4-6 March 2019, Bangkok, Thailand), where member counties presented and discussed their progress reports towards the 3R policy and program on various waste streams. She emphasized that the Forum adopted 'Bangkok 3R Declaration Towards Prevention of Plastic Waste Pollution through 3R and Circular Economy'. Bangkok 3R Declaration expressed some voluntary commitments to reinforce 3R actions towards the issue of plastic waste and to prevent plastics waste leakage into the coastal and marine environment. For the presentation, please visit here.